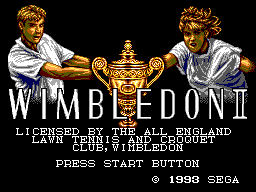 Wimbledon II is the sequel to Wimbledon, and was released exclusively for the Sega Master System in 1993. Plans were made to bring the game to the Sega Mega Drive too, but were ultimately scrapped. Wimbledon II has the same fictional tennis players from the previous game in addition to 4 new male and female (total of 8) athletes.